The season is upon us and this year my motto is "Give Art!" I am counting down the 42 days before 2012 by Facebooking one art suggestion a day and consolidating these suggestions into four blogs of 11 each. This list is by no means exhaustive, so don't hesitate to buy the painting that you think your significant other will like that is hanging in your favorite artist's studio, café, or gallery down the block. And, of course, art doesn't begin and end with paintings, so I branch out here and offer a plethora of ideas, all with the general sentiment of "This Holiday, Give Art!" 1. Visit Talisman Glass Studio and lighting designer, Sharon Gilbert, on December 3 and 4 to blow your own holiday ornaments ($60 to get in front of the furnace and do your own) or just kick back, shop, and watch other people risk their lives. 2. Give your significant other a portrait of what you both love most: your pet! 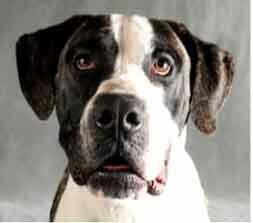 Sheri Berliner is the most talented pet photographer and recently voted the city's most popular. She also puts her money where her mouth is by donating her services. She photographs rescue animals from all over the city. I love her. You will, too. 3. Think you are a Chicagoan? You can't call yourself one officially until you have this book. 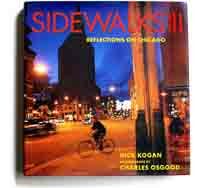 A Chicagoan must-have by the classic duo, Rick Kogan and Chuck Osgood, the Sidewalks II coffee table book takes you to all the hidden places and characters that make this city great, that make this city real. 4. Arica Hilton is what Emily Dickinson had in mind when she said, "I dwell in possibilities." 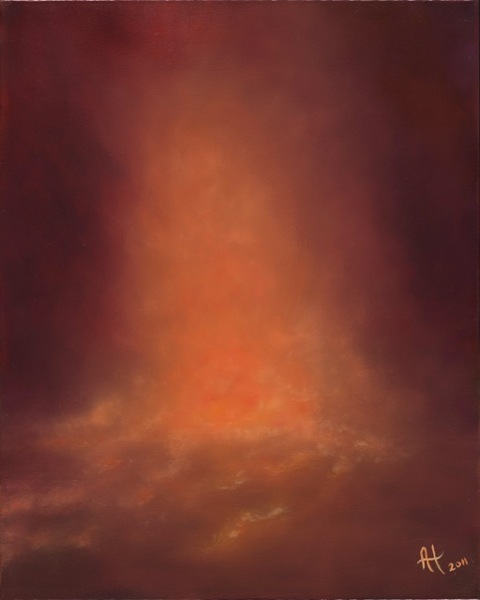 She is a gallerist, the president of the Poetry Center of Chicago and a self-taught painter. She hit the scene big with her first large-scale show this past year, and she is one to get in the early stages! Her limited edition graphics are perfect entry point to collecting her work. 5. Incredibly talented, Nathan Mason's ceramics are subtle, intimate and sublime. And let's not forget affordable! Here is a chance to own something that is as pleasurable to touch as it is to behold. I have written Santa and I have told all of you. So we are all clear on what I want now, right? 6. So you think you can dance? I didn't think so. But wouldn't it be great if you impressed your "other" by nailing down a few tango moves? Take tango for two at Tango 21 with the man who brought tango to Chicago, Jorge Niedas, and score big brownie points. BIG! 7. It's Christmas. So, its time to see A Christmas Carol at The Goodman Theatre. Yes. But how cool would you be if you scored two tickets early for the 10th anniversary of Regina Taylor's gospel musical sensation, Crowns? Show off by being ahead of the game and in the know of what's hot to come! 8. The only artist in residence at the Field Museum, painter Peggy MacNamara is a must-have if you collect watercolors. Her paintings are nature at its technicolor height. Absolutely dreamy. But if a large-scale painting isn't in the cards this season, get the next best thing: one of Peggy MacNamara's books through the Field Museum book store. 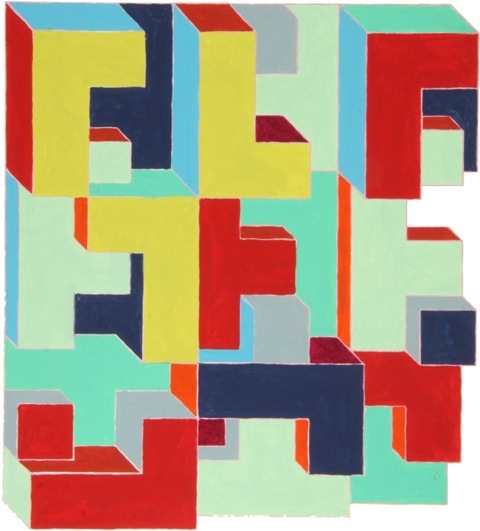 If you get in close with her gallerist, Aron Packer, you may even be able to get it signed. 9. Light and Airy. Serene and beautiful. Challenging and captivating. Thoughtful and provocative. I could only be talking about the work of Diane Christensen. Her recent show at Kasia Kay closes on Saturday, but you can own one of your very own prints, directly from her (on the website of her musical husband, the also stellar, Steve Dawson) with the click of a mouse. This work brings peace and intimacy into any space and its offering speaks volumes about how the giver feels towards the receiver. 10. If you don't want to read into art or find hidden meanings, but you want something that appeals on the fundamental and visceral level of color and shape and energy, you want the work of Tom Burtonwood. Smart, appealing, affordable and distinctive, you are cooler that cool for discovering this diamond in the rough. And if you buy a piece of his work now, he will throw in a signed copy of his book! You can't go wrong. 11. I save the best for last and lay down the law when I talk about the work of Tony Fitzpatrick: a Chicago original, a Chicago tour de force. He is an artist, playwright, poet and dog lover. If you are from Chicago and if you follow art, then you have to own a Tony Fitzpatrick. Sorry, that's just the way it goes. 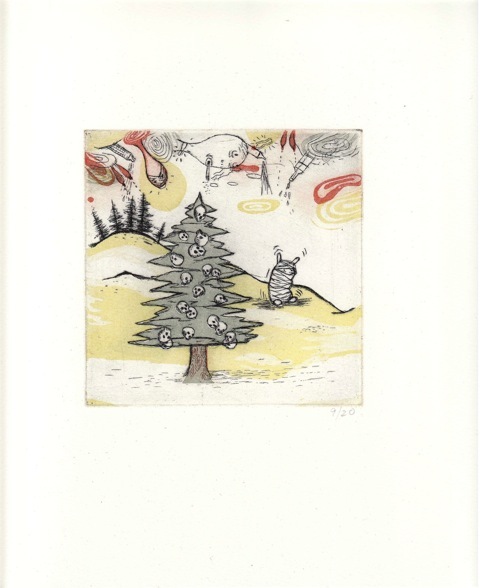 If an original etching or collage won't make it into the holiday budget this year, consider a print from his newest endeavor Black Shamrock Press and you won't be sorry. At the very least, get two copies of This Train, a book of some of his most recent poems, writings and etchings. Get one as a gift, and hey -- you count, too! Treat yourself to a book of the work by a central force of the Chicago art world. To see the power of hist newest work and to get your books signed by Tony in person, be at Firecat Projects, 2124 N. Damen, on December 2, for the opening of Tony's new exhibition, "Nickel History, The Nation of Heat."